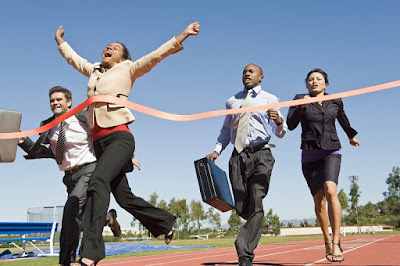 Successful entrepreneurs see competition as an opportunity rather as an obstacle. One of the reasons most start-ups phase out is not because of competition but because they lost the will to fight - persevere. Essentially, a entrepreneur/business biggest threat is themselves/itself. Competition is good. In fact, a healthy rivalry challenges you to work smarter with the resources you have. To do so, leverage your team’s unique talents and build a business that competitors wouldn’t dare challenge. Even if other companies/brands in your industry attempt to undercut your prices and steal your customers, think positively about ways they can help your start up grow. Sole suppliers in an industry quickly stop innovating simply because they no longer have any need to. Sadly, they unknowingly commit to maintaining the status quo. Competitors have a habit of keeping you on your toes. Make it your mission to stand out as the leading authority in your domain of expertise. Your audience will admire your thought leadership and naturally choose you over other competitors. Competition force you to assess your strengths and weaknesses. Use your uniqueness to create a more value proposition to customers. Understand your shortcomings and find ways to overcome them. Competitors will consistently try to offer better customer service, product quality and marketing. In healthy markets, buyers will demand the best solutions for their specific needs. Differentiate your offerings with the goal of creating tremendous value for the users you serve. Competition signals strong consumer demand. It provides validation for what you are doing. In new markets, this is an opportunity to promote an emerging trend that will get buyers and the media excited about your work. Create alliances with like-minded businesses. Exchange technology and ideas, expand the overall market, cross promote each other’s products and collaborate on novel research to educate consumers. Perhaps one day, you might merge with, or acquire, your biggest competitor. Watch the competition carefully. The knowledge and resources they have may be both better and different than yours. Actively learn from how they manage and grow their operation. Soon, you will discover ways to apply those lessons learned to your business. Someone will always be better than you at something -- and that is OK. Customers deserve the best products and services to fulfill their individual needs. To build a profitable business, focus your efforts on making a smaller segment of the overall market very happy. By narrowing your niche, you develop a competitive edge that deters further competition. Without competitors, most firms get lost in the day-to-day exercise of maintaining their business. As other companies join the market, you will need to start challenging yourself to accomplish more. Take your services to a whole new level. Be innovative. Instead of focusing your energy on outdoing the competition, invest in becoming a customer-centric organization. This way, you will boost buyer loyalty and easily defend against aggressive suppliers or vendors intent on stealing your clients. At the end of the day, it is your users -- not your competitor -- who have the power to make or break your business.